The first measurement of a subatomic particle’s mechanical property reveals the distribution of pressure inside the proton. NEWPORT NEWS, VA – Inside every proton in every atom in the universe is a pressure cooker environment that surpasses the atom-crushing heart of a neutron star. That’s according to the first measurement of a mechanical property of subatomic particles, the pressure distribution inside the proton, which was carried out by scientists at the Department of Energy's Thomas Jefferson National Accelerator Facility. The nuclear physicists found that the proton’s building blocks, the quarks, are subjected to a pressure of 100 decillion Pascal (1035) near the center of a proton, which is about 10 times greater than the pressure in the heart of a neutron star. The result was recently published in the journal Nature. Burkert says that the distribution of pressure inside the proton is dictated by the strong force, the force that binds three quarks together to make a proton. Once thought impossible to obtain, this measurement is the result of a clever pairing of two theoretical frameworks with existing data. First, there are the generalized parton distributions. GPDs allow researchers to produce a 3D image of the proton’s structure as probed by the electromagnetic force. The second are the gravitational form factors of the proton. These form factors describe what the mechanical structure of the proton would be if researchers could probe the proton via the gravitational force. Recent theoretical work, however, has connected GPDs to the gravitational form factors, allowing the results from electromagnetic probes of protons to substitute for gravitational probes. The electromagnetic probe consists of beams of electrons produced by the Continuous Electron Beam Accelerator Facility, a DOE Office of Science User Facility. 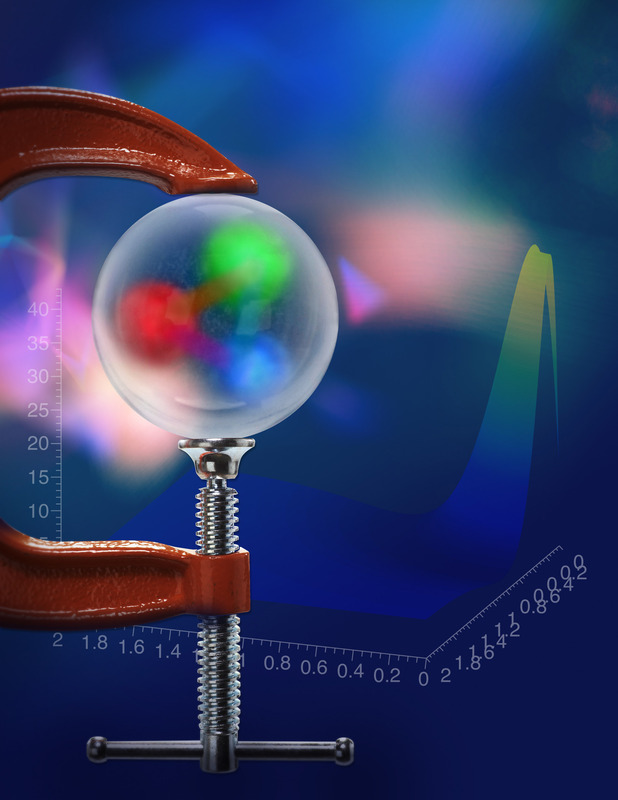 These electrons are directed into the nuclei of atoms, where they interact electromagnetically with the quarks inside protons via a process called deeply virtual Compton scattering. In the DVCS process, an electron enters a proton and exchanges a virtual photon with a quark, transferring energy to the quark and proton. A short time later, the proton releases this energy by emitting another photon and continues on intact. This process is analogous to the calculations Pagels performed for how it would be possible to probe the proton gravitationally via a hypothetical beam of gravitons. The Jefferson Lab researchers were able to exploit a similarity between the well-known electromagnetic and hypothetical gravitational studies to get their result. The researchers say the next step is to apply the technique to even more precise data that will be available soon to reduce the uncertainties in the current analysis and begin working toward revealing other mechanical properties of the ubiquitous proton, such as the internal shear forces and the proton’s mechanical radius. Contact: Kandice Carter, Jefferson Lab Comunications Office, 757-269-7263, kcarter@jlab.org.